Nice transition Scott, club is laying off at 4 nicely. Thanks. I want to set up mirror vision and see how it works. Net practice today working on my priority piece. Face on with 7 iron and driver. Working with the new Mirror Vision app in my gym. I’m hitting foam balls. Here I am working on my head at set up with the feel of my right shoulder being lower to get my head back a bit. Also, I’m working with the pitch elbow feel with the left shoulder going back and up through impact. These are what feels like 1/4 and 1/2 effort swings. The lighting is not that good in here and it’s hard to do slow motion due to the fluorescent lights. A couple more swings from today. Same priorities with a bit of float load feel at the top. Driver and 6 iron at about 3/4 effort. More indoor work avoiding the Polar Vortex. Below I am focusing on my head position at setup including aligning my neck with my shoulder tilt. My head was too far forward before. The line on the hat helps me align my eyes. 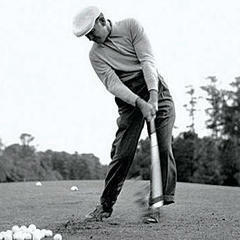 I am also working on the pitch elbow feel and rotating my left shoulder more back and around through impact. This is all from latest my Evolvr lesson. The Mirror app works great for this. Here is the DTL view. There is less early extension this time, which I think is due to rotating the left shoulder back more. I still need to extend more through impact to A8 and 9. Working on the same items, head position at set up, lower hands at A4 and extending through impact. DTL positions look pretty good. Off topic question here but what kind of net is that? I have never thought on doing this but it's a great idea. I could just roll it up and drop it whenever I needed it. Much simpler than putting my collapsible net up and down. I got a 10x 8 net from these guys. It was the square pattern with border. It has held up well. The yellow rope holds the base off the ground which help keep the balls from ricocheting all over the place. I put a pice of foam down to keep the balls from bouncing too. If I had a good place to set up, I would have done it permanently. 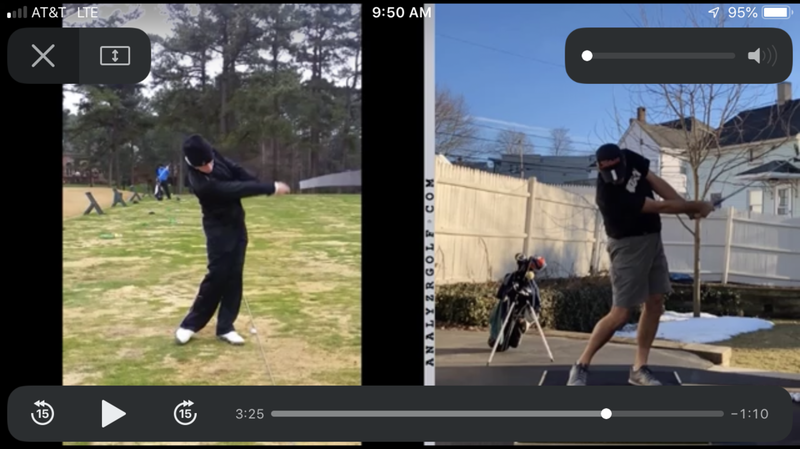 My latest priority piece is to try and get to the position on the left below at A8-9, hips pointing toward target. 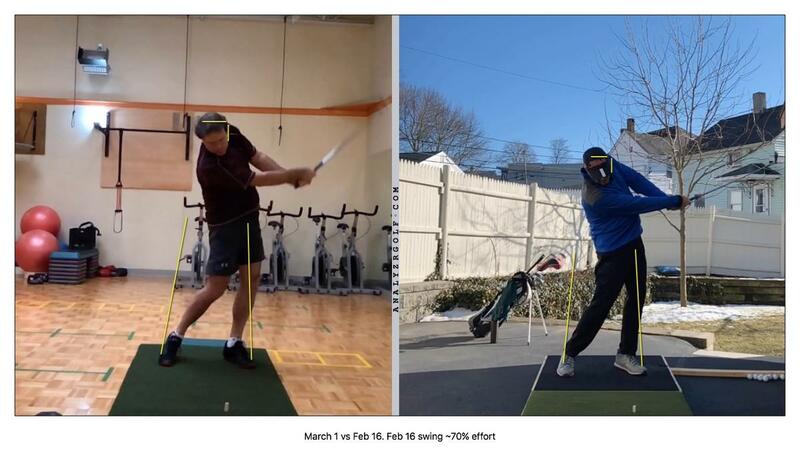 On right right, my hips have slowed down after impact, so the club has overtaken my hands. I worked hard on the previous priorities and they are in good shape. Worked on the new priority piece, hips to target at A8 and 9. Only spent 20 minutes on this as my back was a bit tight. Making some progress. This is a 3/4 effort feel with a finish at A9. Working on the hips to target A8-9 feel. I’m doing this drill to feel the hips continue to rotate through impact. I’m making some progress, but this will take a while to get at full speed. 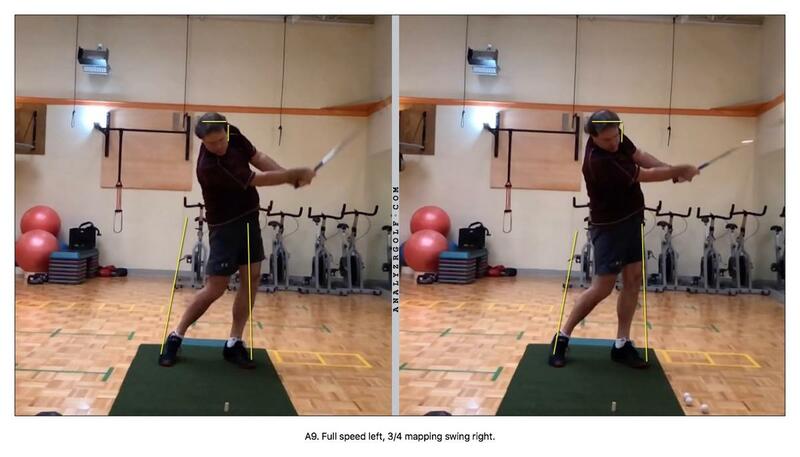 Yesterday working on partial mapping swings to get the position. Basically map down to A6, then pump through to A9. I've been doing this drill to get the feel of the hips. At full speed, I seem to be doing something a bit different. My hips are sliding more, but they aren't rotating as much. 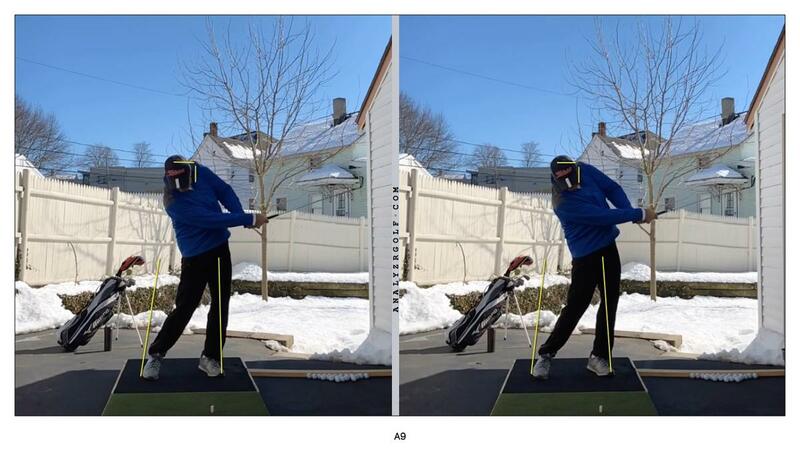 I can see below that my hips have rotated more in the partial swing, but slide more forward in the full swing. I will be discussing with my Evolvr instructor. Today I spent a long session working on various things from chipping and pitching to priority piece work. Below are videos of full swings. Getting closer. 7 iron with the feel of hips to target at A8. DTL positions look pretty good. A little steep at A5. For driver, my left arm is a bit bent at impact. DTL positions looks pretty good though. Same steepness at A5. It is going to snow tonight and be cold for a few days, so back indoors! That swing should be on tour! Yesterdays work. Still focused on hips to target at A8-9. Went through a range of work starting with partial wedges, then 7 iron, 3W and finally driver. Finished with pitching and chipping. I re-read the thread on Flighting Wedges because my wedges were launching really high at the range. 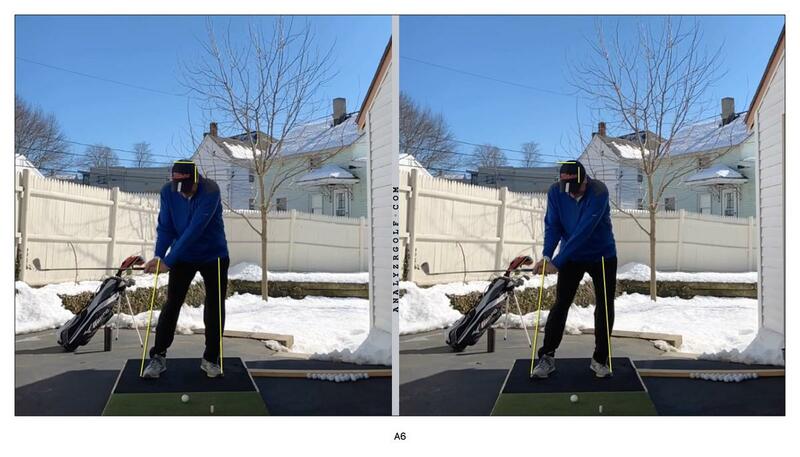 I widened me stance a bit and played the ball back about one ball width extra from my left heel. I worked on this for a while with 1/2 and 3/4 PW and GW. Below is the 3/4 PW. I then progressed to the 7 iron. I am finding a slight difference between a full swing and ~70% swing in terms of positions and feel. I worked on it trying to get the full closer to the 70%. Looks like in the full swing I am shifting a bit toward target instead of staying centered. My head has moved forward a bit at A6. I noticed that with the driver too. I will keep working on that. The hips toward target is progressing, which is good, but I need to keep working on that too. At some point here Scott you're gonna want to let your neck rotate through. It's holding up your torso a bit. From A7 on? I hadn't noticed that. Could it be from hitting into a net and not needing to see where the ball went?